I am not dead. 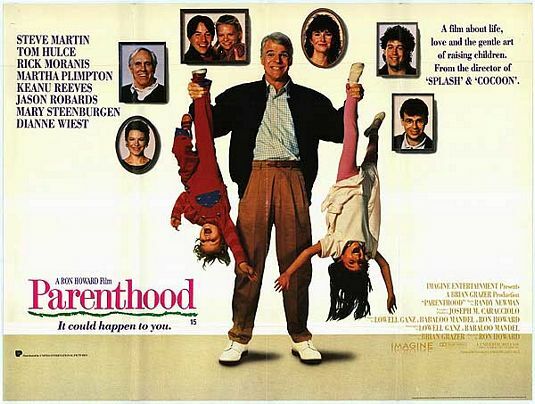 But, if you can’t read the poster well enough, it reads – PARENTHOOD: It could happen to you. Although I would have loved to sail the Caribbean for the past few months while the American South warmed it’s tail, I have been swamped with – are you ready? – the ever glamorous life that I lead as chauffeur to Oompah-loompahs who can’t drive themselves and forget half their stuff. Okay, 75% of their stuff. Yes, I am that woman – hear me roar. No, seriously, you can probably hear me, like all the way across town. Because there are three of them and one of me and those odds have been plain scary lately – when the coffee maker breaks and Baby Girl sprained her ankle, then one of them lost a tooth on the way to school and there’s blood everywhere and I’m out of tissues because the pollen makes Baby Girl sneeze like she’s allergic to LIFE and the 10 year old leaves the check for the field trip somewhere between the car and his classroom and calls me to tell ME that I FORGOT to send it in and my mother calls on the other line in her bright and cheery voice to wish me happy-birthday-dear. It is spring. These poor teachers are cramming as much info into these kids’ heads as they can before the kids check-out for the summer. The kids? Oh, no I think the parents have checked out for the summer. We have been over-Science project-ed, over-book report-ed, we have grown plants from little seeds in Styrofoam cups and watched them die. Just, as I’m sure, have so many families across the country this spring. Parents everywhere- all commiserating. By Thursday, we don’t even talk to one another, we just lift our chin. Don’t even get out of the car. On sports nights, it’s a crazy thought to get a decent meal. You can eat at four in the after noon, like the senior citizens, or around nine o’clock. The other choice is food from a bag, you know what I’m saying. I’ve often wondered about taking that computer charger of my husband’s and seeing if it would work on my crock pot, but the idea of the mess lost out to the convenience of Chick-Fil-A. Unfortunately, this car-as-kitchen arrangement has me using the vacuum at Katy’s car wash quite a bit.That’s a workout, folks. I don’t care how limber you think you are, but I do some serious Yoga moves sucking french fries from under the car seats of my Suburban. So, it gets better. The week of Spring Break my husband has the boys skiing in Colorado, one sprains his wrist and the other falls and gets a concussion. Two visits to the emergency room in TWO DAYS. You know me, I’m in Florida. And might I just say, that while Baby Girl was with me, the worst thing that happened to her was that she scraped her nose on the pool because she decided to swim with her eyes closed. Although, she is the one who jumped off her playhouse two years ago and broke her arm, had to have two surgeries and seven casts, SO. If anyone in our family is likely to say, “Hey y’all watch this!” It’s probably her. These are just the highlights of my last few months. I believe this may be the third or fourth time I’ve even opened my computer. But, all that said, I have some good news!!! According to BelleBridge Books, I’m going to have a short story published in their anthology SWEETER THAN TEA, coming out close to Mother’s Day. I’ll let you know the exact date when I know more. It will be available – like everything under the sun- on Amazon. Posted in travel, Writing and tagged as busyness, crock pots, drive through restaurants, kid's injuries, kid's sports, kids, moms in a hurry, parenting, school projects, skiing, spring break, spring sports, too many school projects. Congratulations…on the story and surviving the end of the school year! Not at all. Just glad I never joined yours. lol See you in a couple of weeks! I’m so glad you are coming!! !